Latest News: On January 8 (see video and “Recent Events,” below), the City Council held a study session about its proposal for the General Plan Update. Staff’s proposal was similar to the one heard on November 14, 2017 (see “Recent Events“). As proposed, it will consist of three phases, the first year of which will consist of a consultant-facilitated “Listen and Learn Tour” collecting input from the community. A five-member citizens committee appointed by the Council will help develop a Request For Proposals for the consultant and recommend who to hire. The resolution formally creating the committee was approved as Item 5 on the January 22 consent calendar. Following a one week application opportunity (applications are due by noon on January 30), the Council deviated from its normal Policy A-2 appointments procedure, and allowed the Mayor to select the five appointees in private consultation with two other Council members. The Mayor will also serve as a non-voting member of the committee. The full Council “confirmed” the Mayor’s selections at its February 12 meeting (see “Recent Events,” below), but plans to expand the committee with two new members to be named on March 12. On February 13, City staff conducted a community outreach meeting at Marina Park with the newly-appointed five-member Steering Committee in attendance, but not participating. The first formally-noticed meeting of the Steering Committee was held on February 20. Originally tasked with reviewing a Request for Proposals for a single consultant to manage the entire General Plan Update process, the committee told staff to “bifurcate” the process and prepare an RFP to solicit a consultant for the public outreach (“listen and learn”) phase only. A separate RFP for a consultant to manage the actual update would come after that. The Steering Committee, with its original five citizen members, reviewed the revised RFP on March 6 and (with all seven citizen members in attendance) completed its recommendations on March 20. On April 3 the committee heard staff presentations about the City’s traffic model and state requirements for the Housing and other elements. It will be meeting again on May 1 to review the responses to the RFP received from potential consultants, which are be due on April 26. While the City was waiting to start its GPU, SPON continued its efforts to press for improvements to the present General Plan and to the prepare public to participate in the broader update. To those ends, SPON created its own General Plan Advisory Committee. The SPON GPAC functioned as an independent citizens interest group. Starting on November 18, 2017, it held multiple well-attended and lively meetings, (see “Recent Events,” below). The last SPON GPAC meeting was held on January 12 (see “Recent Events,” below). SPON thanks all who have and will participate! Project Overview: Ever since incoming Mayor Kevin Muldoon announced the initiation of an update of the city’s General Plan as a major objective for the City Council during the 2017 calendar year, the details of what that might entail have been a moving target. No activity actually occurred in 2017, and it now appears none will occur in 2018 as well. SPON nonetheless hopes to prepare citizens to have some influence over the process as further details emerge, as well as to lobby for improvements to the existing General Plan, most of which was adopted in 2006, and none of which appears to have been implemented entirely as promised. Why We Were Watching: Although SPON has repeatedly called for the development of “comprehensive” plans for specific areas of the city, such as Mariners Mile, West Newport Mesa and the Airport Area, the city proposal could be different and could have worrisome consequences. In 2006, the General Plan update process was used, without the full understanding of most residents, to expand and “reset” the Greenlight development thresholds throughout the city. By approving the updated land use tables and maps, voters in effect gave the “Greenlight” to future projects they assumed they would be given a second chance to vote on, such as the two recently erected high-rise office towers (PIMCO and Irvine Company) in Newport Center (whose erection was specifically contrary to policy statements in the 2006 General Plan) and the massive 524-unit Villas Fashion Island apartment project at the corner of Jamboree and San Joaquin Hills Road. With greater public awareness, a similar, but even more fast-tracked and developer-driven General Plan update effort in 2013-2014 was overwhelmingly rejected when approval of the land use changes was placed on the ballot as Measure Y. While city staff has indicated the present update may not even touch the critical land use limits needing voter approval, some Council members, early on, mentioned hoping to see the matter on the November 2018 or 2020 ballot — which implies that it will. Whatever the process turns out to be, for the sake of “our town” close watchfulness will be needed to ensure the General Plan modifications are resident-driven rather than developer-driven. April 8, 2019: Due date for potential consultants to submit questions they may have about the RFP. April 15, 2019: City staff will post the questions and their responses to them. April 26, 2019 @ 11:00 a.m.: Deadline for consultants to submit proposals in response to the RFP. May 1, 2019 @ 6:00 p.m.: The Steering Committee will be meeting at a location to be announced to review the responses to the RFP. Week of May 6, 2019: Steering Committee to interview top-rated consultants. June 2019: City Council to award consultant contract. July 2019: Kick-off of consultant-facilitated “Listen and Learn” Tour. Early 2020: Council to appoint a large (25-30 member) General Plan Advisory Committee to consider proposals to amend the General Plan based on the results of the “Listen and Learn” Tour. In other upcoming City activity related to the current General Plan, on February 12 the City Council approved a GP amendment to make possible the Harbor Pointe Senior Living project (a use not presently allowed at the proposed site). The Koll Center Residences proposal also requires at minimum a minor change to the General Plan (to transfer 3,000 square feet of retail development allocation), and many, including SPON, have questioned whether the proposal is otherwise in compliance with the General Plan vision for the Airport Area. It was the subject of a Planning Commission study session on January 31. April 3, 2019: The Steering Committee met in the Council Chambers to hear staff reports on the City’s traffic model and the state requirements relevant to the Housing and other elements of the General Plan. The PowerPoint presentations have been posted on the City’s General Plan Update page, and a video of the meeting should be available here. March 26, 2019: As Item 14 on its agenda, the City Council received the Planning Commission’s recommendation regarding staff’s annual report on the status of current General Plan’s Implementation Program and the City’s progress in meeting the Housing Element’s goals and approved submitting the reports to the state regulators. March 25, 2019: City staff posts Request for Proposals (RFP) for consultant to conduct the “Listen and Learn” phase of the General Plan Update process. March 20, 2019: The GPU Steering Committee held its third meeting, this time in the City Council Chambers (agenda here). The Committee, for the first time with all seven citizen members appointed, completed its revisions to the RFP for an outside consultant to manage the “listen and learn” phase of the GPU process, only. The group is also heard a presentation about the Harbor Commission’s visioning process, as well as a presentation from staff about updates to the City’s website. March 12, 2019: The Council approved the Mayor’s selection of two additional community members to serve on the GPU Steering Committee. The new members are Jim Carlson, an architect, and Catherine O’Hara, a former city planner and currently a college counselor. March 7, 2019: As Item 4 on its agenda, the Planning Commission heard staff’s annual report on the status of current General Plan’s Implementation Program and the City’s progress in meeting the Housing Element’s goals, and recommended the City Council direct staff to submit the report to the state. March 6, 2019.: The GPU Steering Committee held its second meeting in the Friends Room at the Central Library (agenda here). The committee recommended changes to staff’s revised RFP for an outside consultant to manage the “listen and learn” phase of the GPU process, only. The committee also discussed the merits of appointing the larger citizens General Plan Advisory Committee before the “listen and learn” ends, and decided to revisit that question later in the year. March 6, 2019 @ noon: Was the deadline to submit applications for appointment as one of the two additional citizen members being added to the GPU Steering Committee. Three new applications were received and added to the 34 previously submitted (but not appointed). February 27, 2019: The City Clerk posted a notice of the two new citizen opportunities to serve on the Steering Committee, and published the notice in the classified section of the Daily Pilot. To be considered, applications must be submitted by noon on Wednesday, March 6, 2019. February 26, 2019: The City Council voted to adopt a new resolution increasing the size of the GPU Steering Committee to seven members (see agenda Item 14). The Mayor, in consultation with the ad hoc nominations committee (consisting of Council members O’Neill and Brenner), will select two new names from among the new and old applications received. Those selections will likely be announced and confirmed at the Council’s March 12 meeting. February 20, 2019: The GPU Steering Committee held its inaugural meeting in the Civic Center Community Room (see agenda here). Although the committee was expected to review a Request for Proposals for a single consultant to manage the entire General Plan Update process, the committee told staff to “bifurcate” the process and prepare an RFP to solicit a consultant for the public outreach (“listen and learn”) phase only. A separate RFP for a consultant to manage the actual General Plan update would come after that. February 13, 2019: City staff conducted an hour-long public outreach event at Marina Park. Per the flyer and announcement, this was to have been the Steering Committee’s inaugural meeting, intended to familiarize the committee and public with the General Plan and seek input on the Request of Proposals for an outside consultant to lead the Update effort. Although all five newly-appointed Steering Committee members were present in the audience to hear the staff presentation, they did not run or participate in the meeting, supposedly because they had not been sworn into office. It also appears staff had forgotten to prepare and post in advance an agenda, as California’s Brown Act requires them to do before a group like this can meet. February 12, 2019: As agenda Item XIII, the Council received the Mayor’s choice of five appointees to the Steering Committee — Nancy Gardner (Chair), Ed Selich, Debbie Stevens, Larry Tucker and Paul Watkins. The full Council (with Duffield absent) unanimously “confirmed” the selections, although on a motion by Council member Joy Brenner it also voted to bring back a resolution expanding the number of members from five to seven, with the remaining two to be appointed at a future meeting. The names were drawn from among some 39 applicants volunteering to serve on the committee. SPON is concerned about these selections because, despite their long histories of service to the City, all the designees, with the exception of Debbie Stevens, were on the review committee (“LUEAAC“) that brought us Measure Y — the ill-fated previous attempt to update the General Plan, rejected by 69.2% of voters in 2014 — with Selich having been the chair of that committee. Two of the designees — Ed Selich and Larry Tucker — were also strong supporters of the proposal to amend the General Plan to make way for the Museum House in Newport Center/Fashion Island (whose approval was overturned in response to a public referendum petition in 2016). February 2, 2019: At its annual planning session, the Council was told the GPU could cost as much as $2.5 million dollars. Staff recommended allocating $1.5 million in the fiscal year 2019-2020 Capital Improvement Program budget, with an expectation another $1 million might need to be added in 2020-2021. January 30, 2019: Noon was the deadline to apply to be on five-member citizens Steering Committee which will be developing a Request For Proposals for an outside consultant, recommending who to hire and overseeing the “Listen and Learn” phase of the City’s General Plan Update, expected to last through early 2020. The Council will then dissolve the Steering Committee and appoint a larger General Plan Advisory Committee to review draft revisions to the General Plan. As explained in more detail below under “Recent Events” for January 22, the five successful applicants will be privately selected by Mayor Diane Dixon after consultation with a screening committee consisting of herself, Mayor Pro Tem Will O’Neill and Council member Joy Brenner. January 23, 2019: Applications invited to serve on GPU citizens Steering Committee. The deadline to apply is noon on January 30. January 22, 2019: As Item 5 on its consent calendar, Council adopted Resolution No. 2019-7 formally initiating the General Plan Update and defining and calling for the creation of a year-long, five member citizens Steering Committee, with the City Clerk then soliciting applications (see video). According to the proposed resolution, the Mayor, after privately consulting with Mayor Pro Tem Will O’Neill and Council member Joy Brenner (whose names were announced at the start of the Study Session under “Clarification of Items on the Consent Calendar”), will privately select the five citizen members from among the applicants. The Mayor will also be on the Steering Committee, but as a non-voting member. The proposed selection process is quite different from the normal one described in City Council Policy A-2 for situations in which a nominations committee is convened . Under that policy, the Council’s nominating committee would present to the Council as a whole at least two names per opening, from among which, at a subsequent meeting, all Council members, equally, would vote, with persons being selected out of that pool when, and only when, a majority vote for them. The Steering Committee will be subject to California’s Brown Act, which means, as with the Council, all of the discussion between members and any direction it gives to staff is supposed to occur at noticed meetings open to the public and at which the public is given opportunities to comment before any action is taken. January 12, 2019: A SPON GPAC workshop was held at the Santa Ana Heights Fire Station. It was the group’s ninth (and for the moment, final) meeting. Guest speaker. Kevin K. Johnson, an environmental lawyer from San Diego, discussed the California Environmental Quality Act and provided information on how to read and more effectively comment on Environmental Impact Reports. There was no PowerPoint, but participants were provided with a number of handouts (copied below) as well as a set of excerpts from the Planning and Conservation League’s very helpful Community Guide to CEQA, a roughly 100 page publication which can be purchased for $35 by contacting the PCL through their website at the previous link. They also have some free examples of ways to create effective and ineffective comments on CEQA documents. August 18, 2018: The eighth meeting of SPON’s independent General Plan Update Advisory Committee was held at the Santa Ana Heights Fire Station. It continued the guest speakers series, with a presentation by a planning principal Laura Stetson from MIG, the private company that conducted the public outreach/community visioning portion of our City’s current General Plan in 2001-2002 (see Item 18, April 10, 2001, City Council meeting). Ms. Stetson shared her thoughts on “Data-driven General Plans,” including how to ensure the community vision expressed in a city’s general plan is actually implemented. 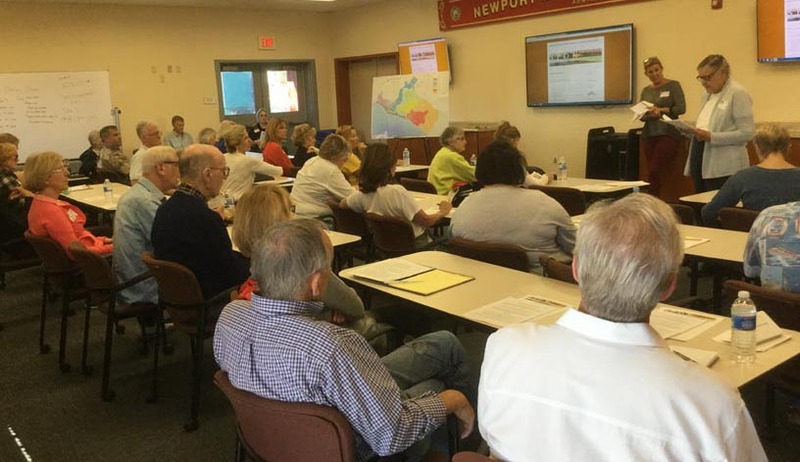 She also provided many detailed insights into the current Newport Beach General Plan. Her PowerPoint includes links to a number of resources where useful planning data can be found. She mentioned an older website of Model General Plans for examples of good plans, as well as the more recent online-only Hayward 2040 General Plan (which she believes to exemplify the wave of the future, at least in terms of presentation). June 16, 2018: The seventh SPON GPAC meeting, held at the Santa Ana Heights Fire Station, continued the recent guest speakers series. Matt Foulkes, the City of Fullerton’s Community Planning Manager, spoke about the Fullerton General Plan, also known as “the Fullerton Vision,” which modified the “standard” layout of a General Plan by focusing on the four key pillars of the community: the built environment, the economy, the community, and the natural environment. April 14, 2018: The sixth SPON GPAC meeting, held at the Santa Ana Heights Fire Station, featured Pete Peterson, Dean of the Pepperdine University School of Public Policy, and Jennifer Lilley, an urban and regional planner working for the City of Brea, who provided insights on how to better engage government officials and drive change (rather than just respond to it). March 31, 2018: The fifth SPON GPAC meeting, held at the Santa Ana Heights Fire Station, inaugurated a planned guest speakers series. Chris Carter, GIS manager for the City of Anaheim, gave an fascinating talk on the push for cities to provide “open data” and the difficulties of making that data engaging and useful for the general public. SPON, and its GPAC Working Group, feel there are multiple problems with the City’s current General Plan and with its implementation since its adoption in 2006. Although the City Council rarely shows much interest in this annual item, it is an opportunity for the public to show they’re interested, watching and engaged — including asking questions about whether a rash of bad planning decisions (Banning Ranch, AutoNation, 150 Newport Center and Museum House, to name a few) has been the result of a bad plan or bad execution of it. Being a “Current Business” item means that not only will the public be allowed to offer their comments, but the Council will be invited to discuss the report, and the public’s comments on it, among themselves (although they have no requirement to do so). This year’s nearly identical report to the Planning Commission is here. The Commission showed little interest in it, but the one suggestion they offered appears to have been ignored by City staff. It was to mention under the report on progress made in 2017 on Implementation Program 1.2 (keeping the General Plan up to date) that the City had at least started considering the need for a General Plan update. Last year’s report to the City Council is here (Note that it is mostly the same as this year’s report, even though there have been substantial changes in the state requirements — one of many things not mentioned in the report. In particular, although the report repeatedly states it is being submitted pursuant to California Government Code Section 65400, that section was extensively revised effective January 1, 2018, and the report about to be submitted appears to be missing the information newly required by subsections C through I. In addition, the California Office of Planning and Research issued entirely new General Plan Guidelines in 2017, and there is no evidence our General Plan has been compared against the new guidelines, even though Imp 1.3 requires such disclosure). Regarding the items it’s important to comment on, including the City’s failure to provide clear information on the development capacity remaining under the existing General Plan limits, and an even more serious problem with the published development limits not correctly representing the development that has been approved, and thus short-circuiting what the public thought were our Greenlight protections, SPON has prepared some background information and some possible talking points. You may also find helpful the questions about the City’s execution of the Implementation Program that SPON submitted to the Community Development Department in advance of its February 26 “Open House & Community Forum,” which remain unanswered — and the additional public comments submitted when this item was before the Planning Commission on March 8. March 8, 2018: City staff’s Annual Status Report on the state of the General Plan was presented to the Planning Commission as Item 8 on their agenda. The Commission showed little interest in it, and recommended passing it on to the City Council with no suggestions for changes or actions to be taken as a result of it. Several members of the public attempted to comment on the report, and its shortcomings. They were treated shabbily. February 26, 2018: SPON submitted to City staff a letter raising questions about the City’s compliance with the General Plan Implementation Program(s) adopted in 2006. SPON hoped some of those questions could be answered at the Community Development Department’s first ever “Open House & Community Forum” on February 26, but the forum’s format did not allow for that. A written follow-up was promised, but none has been received. February 24, 2018: The fourth SPON GPAC meeting was held in the Santa Ana Heights Fire Station training room. The main segment focused on the promises made in the existing General Plan and the extent to which they have been met, or not, with emphasis on City staff’s assessment of that as seen in their Annual Status Report to the state. The meeting materials included the SPON GPAC agenda and a link to City staff’s 2016 Annual Report (as presented to the Council on March 28, 2017). It includes a copy of the Implementation Program followed by the status of each task. A new report for calendar year 2017 will be presented to the Planning Commission on March 8, and to the City Council on March 27. Those who missed the meeting may view the 2/24/2018 SPON GPAC presentation here (although it may be hard to follow without the words). February 13, 2018: As consent calendar Item 7, the City Council was expected to adopt a resolution confirming a “go slow” approach to the General Plan Update, with 2018 being largely devoted to listening and educating, with any actual update starting only after that is completed. Instead, the Council unexpectedly changed direction, with Council member Scott Peotter encouraging staff to prepare an alternative resolution (available only to the public attending in person) putting off the start of the staff-facilitated “listen and learn” workshops, that it had been agreed should precede a GPU, until 2019. As a result of Resolution No. 2018-7, no staff activity at all on the GPU is expected during calendar year 2018. February 8, 2018 – CANCELLED: The Planning Commission was expected to hold a meeting (agenda here) devoted entirely (because of postponement of the night’s two hearing items) to a discussion of property development standards (including what to do about “mansionization”) in the Cliff Haven area (the blufftop neighborhood between Newport Harbor High and PCH). Despite having received numerous messages of interest, City staff announced (just a few hours before it was scheduled to begin) that the February 8 Planning Commission meeting would not be held. Supposedly, staff decided not to address Cliff Haven separately, but to include it in a broader investigation of similar concerns citywide, in some forum yet to be determined (but apparently not involving the Planning Commission). January 29, 2018: At a special Monday evening annual Planning Session held at Marina Park, after receiving a PowerPoint on the subject, the City Council discussed if and when to embark on a General Plan Update. The Council’s direction (modified slightly on February 13) appeared to be for staff to embark soon on a program of listening to the public (“with an educational component”), but not hire consultants and launch a full-blown update until state housing requirements for the near future are better understood. January 13, 2018: A capacity crowd met at the Santa Ana Heights Fire Station for the third meeting of SPON’s independent citizens GPAC group. Through its GPAC working group SPON hopes to create an informed citizenry to participate in and influence the General Plan Update outcome, as well as to produce citizen-driven alternatives for conduct of the update process. At this third meeting the participating citizens pored over maps of the city, identifying areas where current General Plan policies appear to be working, and identifying areas where improvement is needed. December 2, 2017: SPON’s independent citizens GPAC group held its second meeting at the Santa Ana Heights Fire Station from 1:30 to 3:30 p.m. The group generally agreed that a update to the General Plan is needed, and will assist SPON in formulating a letter to the City to that effect. The resulting letter was approved by the SPON Board and sent to the City on December 11. November 18, 2017: As was apparent from Measure Y, SPON anticipates that City staff and Council may have a vision and goals for the future of the City that diverge markedly from the views held by a majority of residents, and even business owners. As a result, SPON convened a meeting of interested citizens, calling themselves the SPON GPAC, to review what happened on November 14 and assess interest in creating an independent, truly citizens advisory panel to monitor developments and attempt to keep the City’s process on a track residents approve of. Such true independent citizens’ oversight was lacking from previous GPU efforts in Newport Beach. The response was a enthusiastic, and a second meeting will be held on Saturday, December 2. November 14, 2017: Based on the City’s announcement, formal initiation of a General Plan update process was expected to come at the November 14, 2017, City Council meeting. A discussion of staff’s update proposal was expected at an afternoon public “study session” (see Item SS3, PowerPoint and video) followed by action at the regular evening meeting (Item 18). A staff team leading the effort was also announced. It was to consist of Community Development Director Seimone Jurjis, former Principal Planner and newly-appointed Deputy Director Jim Campbell and Associate Planner Ben Zdeba, and in addition to outside consultants, the larger plan involved the appointment of a Steering Committee (to consist of Council members O’Neill and Herdman and former Council member Nancy Gardner) and a citizens advisory committee (“GPAC”) chaired by Ms. Gardner and consisting of 4 Commissioners and up to 25 community members (it might be noted that it is unusual for City staff to specify who the City Council should appoint). Largely rejecting staff’s recommendations, the Council instead leaned toward a slower and more deliberate evaluation of the current situation before launching into a major and costly update process. That alternative approach might include creation of a “Blue Ribbon Committee” to consider the need for an update and explore options for conducting it, but no final decisions were made on November 14. Staff’s initial suggestion for the alternate exploratory committee was for one consisting of 10 members: a resident or business owner from each of the City’s seven Council districts, plus a member of a board or commission plus two Council members. Although it was originally thought a variation of that alternative might be coming back for consideration by the Council as early as November 28, it now looks like that will not be happening until next year. June 13, 2017: Funding for the update ($1 million in the first year, with at least another $1 million expected in later years) was allocated, without much discussion or direction, in the budget for the fiscal year beginning July 1, 2017. May 18, 2017: At the Corona del Mar Residents Association‘s May 18, 2017, meeting, the City’s then Community Development Director, Kimberly Brandt, and then Deputy Director, Brenda Wisneski, gave a presentation entitled “Local Coastal Plan Amendments (Shoreline Properties) & future General Plan Update Project” (see the agenda). As part of the latter presentation, they distributed a flyer describing their vision of the GPU project. Although most of this has not yet been approved by the City Council, the flyer indicates staff sees the present calendar year being used to select an outside consultant and appoint an Advisory Committee. Work on actually revising the General Plan would begin in January 2018, with adoption expected in March or April 2020. Although funding for Year 1 was subsequently approved, Ms. Brandt retired on July 28, and Ms. Wisneski left to accept a job in another city at the end of September, which may delay the plans as new staff is put in place. As of late September, the new Community Development Director, Seimone Jurjis (former Deputy Director overseeing the Building Division), has indicated a Request for Proposals for consultants is being prepared, but will be submitted to the City Council for review and approval before actually being posted. February 16, 2017: Incoming Mayor Kevin Muldoon announced a General Plan Update as a major priority for the coming year in his speech at Speak Up Newport’s 36th annual Mayor’s Dinner (City video here). February 14, 2017: City Manager Dave Kiff described a proposal for a General Plan Update in a PowerPoint slide presented at a Council study session regarding the upcoming budget. A set of City webpages regarding the General Plan Update has been posted and should be consulted for the City’s latest official news about the process. The Environmental Impact Report prepared in connection with the 2006 update. See particularly “Volume 1A,” which is the Final EIR which contains tables showing how the “EIR project” was scaled down during the hearings before the Planning Commission and City Council. Additionally, although not available online, the reference shelves of the Newport Beach Central Library include a binder of Technical Background Studies that supported the 2006 General Plan. The City is also known to have agendas, minutes and meeting materials from the hearings held during development of the 2006 General Plan, but aside from those before the Planning Commission and City Council they have not been made accessible online. In parallel, but separate from this, and responding to a separate state mandate, Newport Beach has a Coastal Land Use Plan additionally controlling development in the roughly half of the City in the Coastal Zone. This was first adopted by Council Resolution 82-25 in 1982. The CLUP underwent major revisions in 2005 (with Resolution 2005-64) and again in 2009 (with Resolution 2009-53). Only in January 2017 did the City receive certification of the Implementation Plan portion of the Local Coastal Program, which now exists as Title 21 of the Municipal Code. Title 21 largely mirrors the Zoning Code (Title 20), but gives the City the authority to issue most Coastal Development Permits. That plan, addressing Land Use, Streets and Highways, and Parks and Recreation, was adopted by Resolution 4728 at the City Council’s January 13, 1958, meeting (see minutes). However, the plan itself does not appear to have been preserved. The General Plan resulting from the Newport Tomorrow effort was adopted in pieces between 1973 and 1974. For example, the Land Use Element was adopted by Resolution 7968 (May 29, 1973) while the Circulation Element was adopted by Resolution 8206 (March 11, 1974). Unfortunately, the resolutions reference documents “on file in the City Clerk’s office,” which may or may not have been preserved for posterity. The next major revision of the General Plan came in 1988, with adoption of a new Land Use Element with Resolution 88-100 and a new Circulation Element with Resolution 88-101. In this case, the full documents have been posted with the resolutions, and can be viewed at these links. As described in Resolution 88-100, the 1988 update process, which began in February 1987 and was completed on October 24, 1988, does not seem to have involved “visioning.” Instead, staff appears to have prepared the updates over a period of about a year, after which they were vetted with stakeholder groups by a small committee of Council members, followed by hearings before the Planning Commission and City Council. The new Land Use Element defined, described allowable development in, and set limits for each of a large number of “statistical areas” — which became the conceptual basis for controlling future growth in the citizens’ Greenlight initiative of 2000, adopting City Charter Section 423. As detailed in Resolution 2000-98, Greenlight (“Measure S”) was adopted by a 63% margin despite vigorous opposition from development interests, which pushed an opposing “Measure T” (that lost by an equally large margin). The current General Plan followed on the heels of Greenlight. 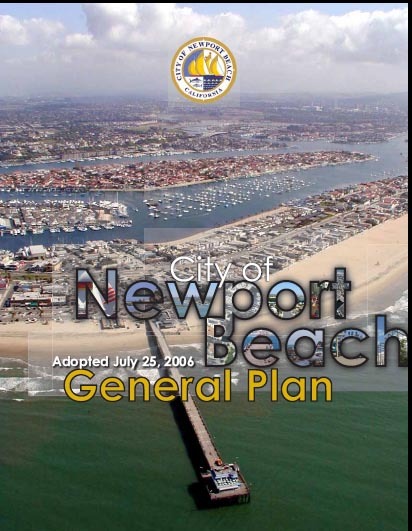 A new “visioning” process, officially lasting 10 months, started with the production by outside consultant, in November 2001, of the booklet “Newport Beach: current conditions, future choices: step up to the future!” and culminated in a November 16, 2002, “Visioning Summit” as detailed in the consultant’s report to Council (January 28, 2003, Study Session Item SS2). The 2000-2006 GPU process involved a General Plan Update Committee (“GPUC,” initially created by Resolution 2000-45, with several later revisions) interposed between the Council and a larger citizens General Plan Advisory Committee (“GPAC,” created by Resolution 2001-22), very similar to what is currently being proposed, except that the visioning and updating were performed by two different outside consultants. Agenda materials and minutes of the meetings of these two committees, produced in response to a Public Records Act request, have been temporarily uploaded for viewing at this link. The new draft General Plan was adopted by the City Council with Resolution 2006-76 on July 25, 2006, contingent on voters “giving the Greenlight” to the new development limit tables. That question was submitted to the County Registrar via Resolution 2006-77, and voted on as “Measure V” the following November 7. Based, perhaps in part, on the City Attorney’s analysis, it passed by a narrow 53.6% margin (see Resolution 2006-103). Several of the General Plan elements have been amended or replaced in subsequent years, resulting in the plan currently presented on-line. While the many changes have been made to the development limits allowed by the Land Use Element (see City’s list of General Plan Amendments), no changes appear to have been made to the underlying Land Use Element text and policies adopted by the Council in 2006. The policy changes proposed as part of the 2013 through 2014 attempt to update the Land Use Element, culminating in Measure Y, seem to have been abandoned when voters, by a 69.2% margin, rejected the changes to development limits that went with them. A new Zoning Code was adopted with Ordinance 635 in 1950. General Plans and Zoning (2007) : a very useful and readable “outsiders” overview of California land use regulation, including General Plans and Zoning Codes, prepared by the California Department of Health Services, specifically for those interested in pursuing healthy living initiatives. Orange County General Plan Resource Directory (2011) : publication from Friends of Harbors, Beaches and Parks highlighting desirable policies from General Plans in Orange County (and other parts of California). Includes more general information on General Plans and planning in general, with a focus on creating sustainable communities. Land Use 101 (2015) : detailed citations to the legal authority (and limitations) of California land use planning, prepared by the of the San Luis Obispo City Attorney. Land Use and Planning (2010) : useful overview publication from California’s Institute for Local Government. 150 Years of Land Use (A Brief History of Land Use Regulation, 1999) : a private attorney’s view of the tug-of-war between development and regulation in California, and its status circa 2000. General Plan Overview : FAQ handout about General Plans from the December 2, 2017, SPON GPAC meeting. SPON letter to City Council urging General Plan Update (December 11, 2017). July 25, 2006 City Council meeting (where the Council voted to approve the GPU as Item 18 and put the Greenlight tables on the ballot as Item 21). Allan Beek speaks at 2:17:50. Larry Porter speaks about the City’s failure to address water and climate change starting at 2:26:50, saying with regard to the EIR, “don’t certify this false document” at 2:31. Elaine Linhoff talks at 2:31:15 about moving housing from Banning Ranch, where it won’t happen, to Mariner’s Mile, where it will. Sandy Genis comments on (with regard the EIR numbers) “that’s magic” at 2:36:55, about the “special qualities of Newport Beach” at 2:37:45, and “why change that?” at 2:38:30. Jan Vandersloot notes his 4 years on GPAC at 2:38:45, that the measure being proposed is a “developer’s wish list” at 2:43:20, and recommends keeping the old plan at 2:43:20. Nancy Gardner (chair of the Council-appointed GPAC) rebuts the other public speakers at 2:43:50, proclaiming the GPU is good because it will add “workforce housing” to the Airport Area. Phil Arst starts at 2:45:40 and returns at 5:06:15 (for Item 21, where he accuses last minute changes to the ballot wording as changing it into a “marketing message” — which the opponents weren’t allowed in their Greenlight II). At 2:47:20 he charges the ballot measure is a violation of the Charter because it claims it will given voter approval to all previous non-voter-approved amendments — but Charter Section 423 requires each amendment to be voted on separately. At 2:48:45 he attributes the purported “reductions” to comparing the projections to “phantom trips” that would never have happened under the existing plan. June 13, 2006 City Council meeting. Phil Arst speaks starting at 3:38:20 and ticks off a litany of problems with it. It assumes a 19th St bridge when there will be none (3:40:50), the measure would arbitrarily increase the allowable floor area ratio in CdM (possibly allowing the present mansionization?, 3:41:20), it adds sloped parts of a lot to the “buildable area” (even though it’s not buildable) thereby increasing the development allowed (3:42:50), it introduces new, out-of-character extremely dense housing categories for no apparent reason (3:43:15) and it is a fatally flawed EIR (3:44:10). May 9, 2006 City Council meeting. Jan Vandersloot comes to the podium at 3:23:30 to comment on Item 17, despite Mayor Don Webb giving him condescending looks. Jan argues there is no way the proposal to add mixed use housing to the harbor side of Mariner’s Mile could decrease traffic, and their action to allow it will be completely contrary to what the residents of Newport Heights want. At 3:23:30, Councilman Rosansky agrees with Jan, saying the GPU will make Newport Beach like the housing being added in Costa Mesa, and offers an amendment to remove the housing. He can’t get a second, but warns Webb his constituents will be mad. This entry was posted in News, Watch List and tagged General Plan, general plan amendments, Land Use, Land Use Element on March 1, 2018 by Jim Mosher.